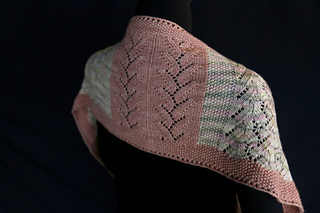 This design is a fantasy look from my window into the garden and features stitch patterns that resemble foliage and spring flowers and colors that are reminiscent of my memories of colors appearing in the late spring. 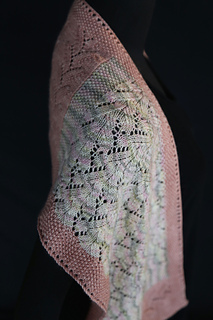 My Garden Window is knit from the bottom up, and features three stitch patterns: a foliage lace pattern in the solid color; a seed stitch pattern, worked in both the solid color and variegated colorway; and a lace wedges pattern worked in the variegated colorway. 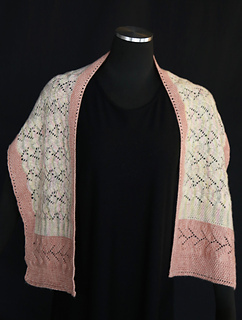 It was knit on 3.25mm needles using Eden Cottage Yarns Hayton 4-Ply in Briar Rose and Cosmos Flowerbed (1 skein each). It measures 56 in x 11 in / 142 x 28 cm.